Sea ice melted back super fast across the Arctic Ocean during the first two weeks of June and now covers the smallest extent ever observed for this time of year, according to the latest update posted by the National Snow and Ice Data Center (NSIDC). Bathed in above-freezing air, a patch of ice as large as Illinois has been dissolving on some recent June days under 24 hours of sunshine. That’s twice as fast as the expected climatological rate, the NSIDC said. “The main contributors to the unusually rapid ice loss to this point in June are the disappearance of most of the winter sea ice in the Bering Sea, rapid ice loss in the Barents and Kara Seas, and early development of open water areas in the Beaufort and Laptev Seas north of Alaska and Siberia,” the update explained. Tracking the wax and wane of the polar ice cap with satellites has become one of the most intriguing methods for gauging climate change in the Arctic. Sea ice helps stabilize the world’s climate, but has been shrinking to record and near record levels during the summers since the turn of the century. This loss is thought to speed up global warming because darker open water absorbs more solar energy than reflective white floes. The disintegration of sea ice may also threaten healthy populations of polar bears, walruses and seals because they rely on its surface for hunting and denning platforms. Later ice return in fall exposes Alaskan villages to catastrophic storms and erosion. Overall retreat from northern Russia will also open shipping routes between Europe and the Pacific, possibly leading to an explosion of maritime traffic through regions that presently lack deep-water ports, law enforcement or disaster response. As a result of the most recent melt, the overall ice extent averaged about 4.1 million square miles at mid-month — slightly lower than the previous record set in June of 2010 and lower than the extent seen during the same period in 2007, the year that sea ice hit an all-time low in September. Putting it into perspective, this June’s sea ice was more than one Massachusetts smaller than the previous record, about 12,000 square miles. The overall footprint was still immense, however, about as large as Canada and Alaska combined. The melt season has only just begun, really, with its climactic nadir not due for another three months. Still, what gives? 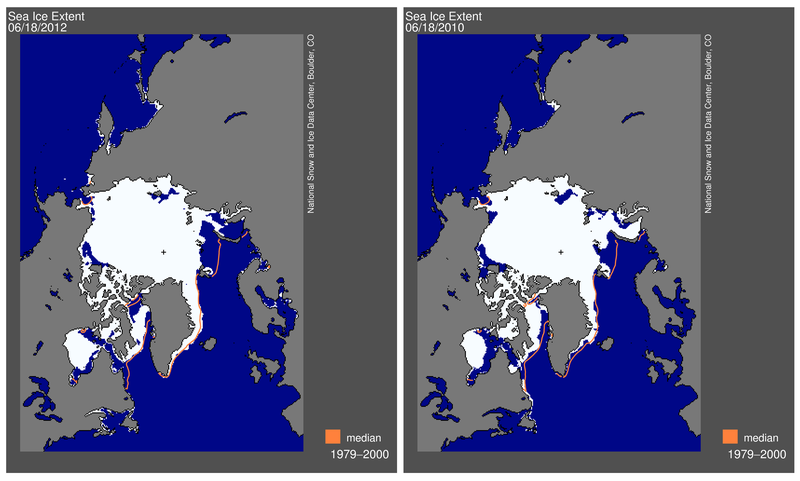 After all, didn’t sea ice seem to be chilling toward a rebound only last winter? Didn’t we just shiver through one of the iciest winters of the past dozen years, with Alaska’s Bering Sea virtually encased in big-dog floes? 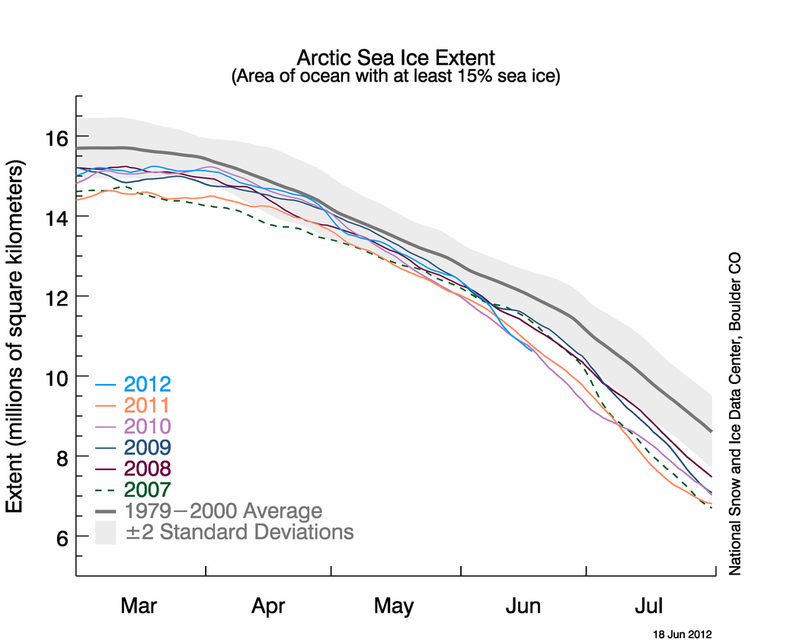 All winter long, Arctic sea ice was poised for quick disintegration given the right mix of conditions. Even after brutal cold pushed new thin sea ice to record and near record cover close to Alaska, the extent in waters north of Europe remained especially low. Even more important, the volume of sea ice — the surface footprint plus the ice hidden out of sight underwater — remained alarmingly low. The latest estimate of sea ice mass is about the smallest ever calculated for any time of year, with only the full summers of 2010 and 2011 showing more startling anomalies, according to the newest sea ice volume chart posted by the Polar Science Center at the University of Washington. And so, when June hit with its summery vengeance, the polar veneer was primed to peel. 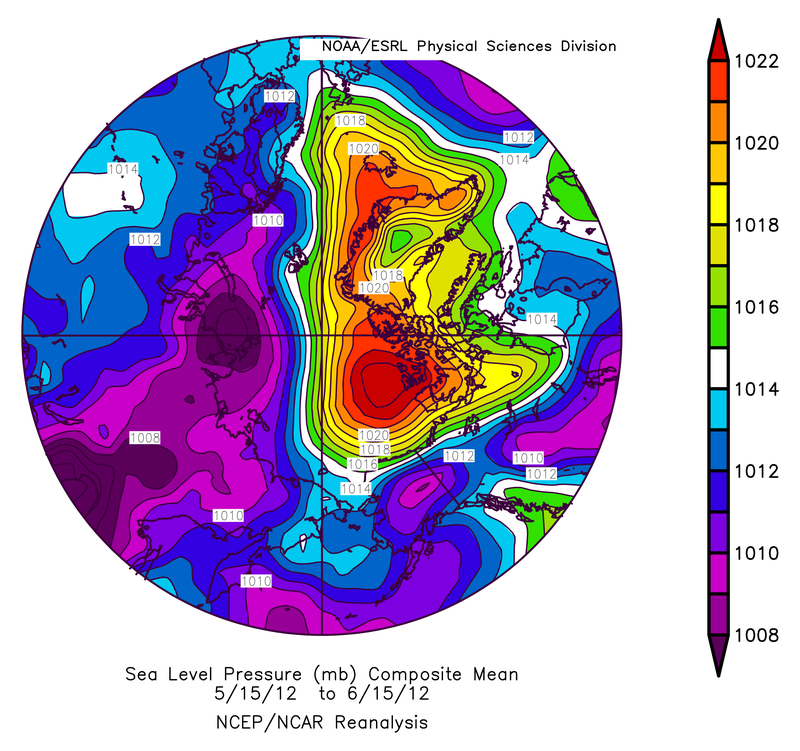 The peculiar alchemy of air pressure patterns bringing clear skies to some polar regions and strong winds to others has been especially “favorable” for sea ice retreat and melt, the NSIDC explained. Even more ominous, this recent weather pattern — including high pressure over Alaska’s Beaufort Sea — closely resembles what occurred in 2007. Still, it’s early in the melt season, NSIDC cautioned. Much can shift over the next 90 days.